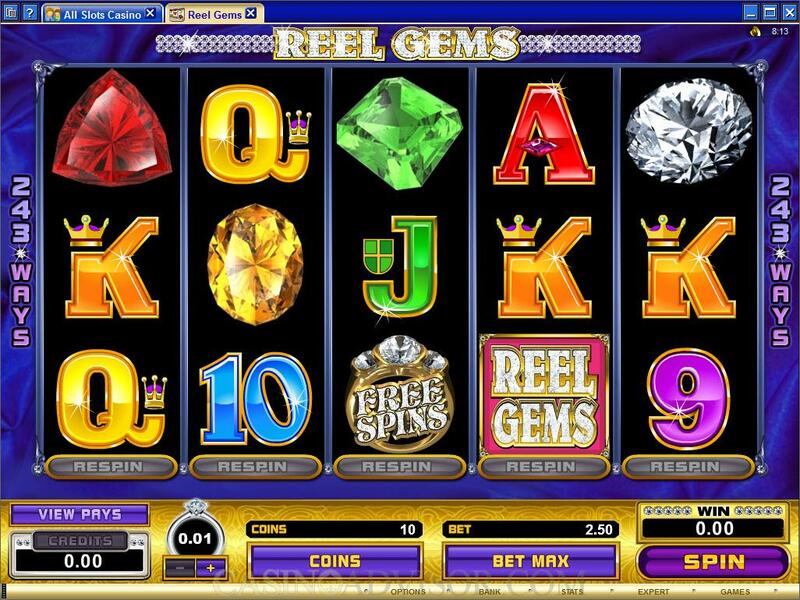 Reel Gems has the popular precious stones theme. The main symbols are a number of brightly colored large gems. They are followed by high value card symbols from Ace to Nine. All the symbols are crafted with elegance and display a richness that is suited to the theme. The reels are set in the background of satin, which enhances the ambience of wealth and the game title and the operating buttons are designed to go with the theme. There are two special symbols. The Reel Gems logo is the wild symbol. It neither offers payouts, nor acts as a multiplier and appears only on reels 2 and 4. The Ring with diamonds set in gold and emblazoned with Free Spins is the scatter symbol. 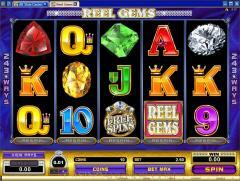 Reel Gems is a 243 Ways slot game. There are no fixed paylines. Wins are awarded for left to right adjacent symbol combinations. Players can wager up to 10 coins per payline. The number of coins wagered per spin is automatically fixed at 25 times the selected number of coins per payline. A maximum of 250 coins can be wagered per spin. The coin denomination varies from 0.01 to 0.50. The options available are 0.01, 0.02, 0.05, 0.10, 0.20, 0.25 and 0.50. Hence the maximum line bet in credits works out to 5.00 and the maximum total bet in credits works out to 125.00. The Ring is the scatter symbol. When two or more scatter symbols appear anywhere on the reels scatter payouts ranging from 1 coin to 100 coins are awarded. These are converted to credits by multiplying by the total bet. Three or more scatter symbols appearing anywhere on the reels activate the free spins bonus round. 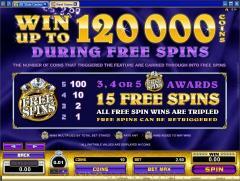 Fifteen free spins are awarded at tripled payouts. 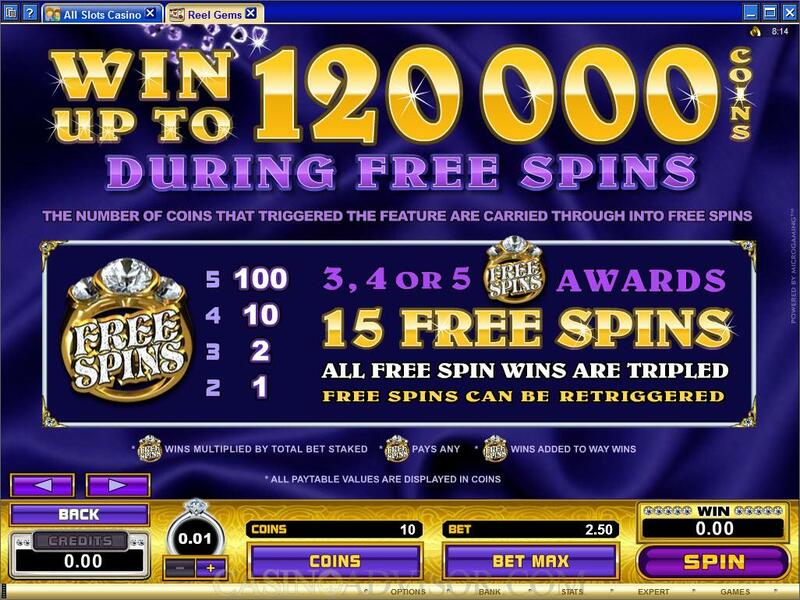 The maximum amount that can be won in the free spins round is 120,000 coins. Reel Gems has the innovative feature called Respin. It is introduced in the introductory clip as “Sometimes one more spin is all it takes to win.” Below each reel there is a Respin button. At the end of every spin the cost of respinning that reel independently is displayed below the button. Players can, if they so desire, choose to respin any one reel by paying the cost. Because Reel Gems is a 243 Ways slot the probability of getting a winning combination in a respin is higher. On a respin only the wins that involve the respun reel are paid. The players can respin as many times as they want to and can respin different reels as well. However they can only respin at the same betting parameters. If the betting options are changed the Respin feature is disabled. This feature is not available in the free spins bonus round. Interested in reading more detailed information about Reel Gems? If so Click Here for more details.